LAUSANNE (Switzerland) -- WBSC's International Baseball officials in Lausanne made two major announcements Tuesday on the II U-15 IBAF Baseball World Cup regarding the final participating countries to be included in the event and the expansion of the youth world championship from sixteen countries to eighteen countries. 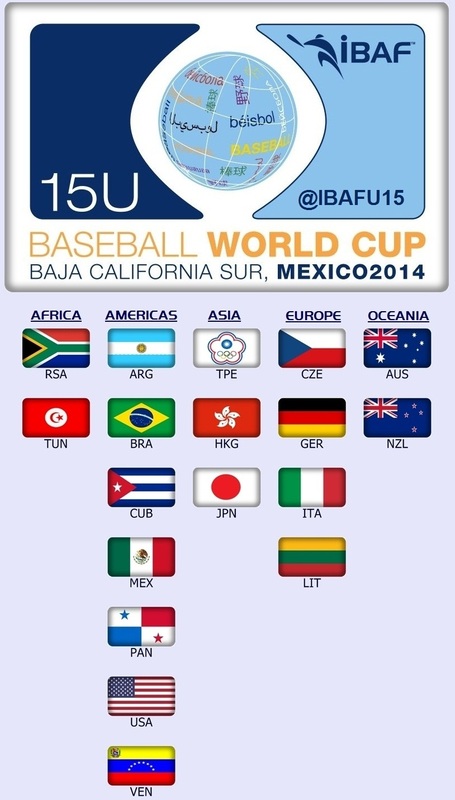 International Baseball officials had only previously released the names of fourteen countries that would participate in the sixteen team U-15 Baseball World Cup this summer in Baja California Sur, Mexico. It was announced today that world No. 14 Australia and No. 28 New Zealand will represent Oceania at the 2nd U-15 Baseball World Cup, completing the original field of sixteen countries, with the opening ceremonies and competitions now beginning on 31 July, a day earlier than previously programmed. WBSC officials underlined the accelerating growth path, accessibility and universality of baseball and softball, citing that the spread of the U-15 Baseball World Cup "blankets" the globe, spanning North and South Africa, the Americas (North-, Central- & South America and the Caribbean), Asia, Europe (Baltics, Central- and Southern Europe) and Oceania. "WBSC, our National Federations, our professional league partners and the youth leagues are heavily invested in promoting our sport around the world to attract, develop and empower great young athletes," said WBSC co-President Riccardo Fraccari. "And today's announcements mark a significant breakthrough for our sport, not only for the unprecedented universality and historic firsts, but also for the impressive quality, level of competition and attractiveness of the U-15 Baseball World Cup itself." There will be a record two representatives each from both Africa and Oceania, and it will be the first time either continent has ever been represented in the U-15 Baseball World Cup. Previously, Africa and Oceania had only each ever been represented by a maximum of one country in a world championship competition of any level -- youth or professional. The U-15 Baseball World Cup in Mexico will also mark the historic debuts of New Zealand and Tunisia to be on the international stage and participate at a baseball world championship of any level. One of WBSC's flagship youth events last year, the IBAF U-18 Baseball World Cup, had a potential broadcast reach of 144 million homes and potential online/mobile reach of 20 million. WBSC officials stated they will continue with plans to increase baseball and softball's stronghold and global positioning in the youth sports market to provide increased pathways for females and youth to engage in sport -- especially in targeted high-potential emerging territories across Africa and the Middle East. "While the sports world now shifts its focus to the youth/lifestyle demographic, the WBSC is proud to be at the forefront of youth sport with already successfully established and marketable youth engagement platforms like our U-15 and U-12 world championships," Fraccari underlined, "and the WBSC is committed to connecting with more youth, women and cultures to increase access to our sport and grow the brand and reach of our youth properties aggressively." Launched by the IBAF in 2012, the U-15 (ages 13-15) Baseball World Cup has established itself as the premier international baseball event for this youth age category, with the best under-15 baseball players in the world representing their countries on their national teams every two years. At the inaugural IBAF U-15 Baseball World Cup in 2012, Venezuela defeated Cuba to win the gold medal, while Chinese Taipei earned the bronze. The 2014 WBSC competitions calendar includes the youth U-19 Men's Softball World Championship in Canada, the Women's Softball World Championship in the Netherlands, the Women's Baseball World Cup in Japan and the inaugural youth U-21 Baseball World Cup in Taiwan (ROC).